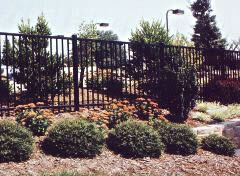 The Classic style fence features extended pickets topped with an arrow-shaped spear point. 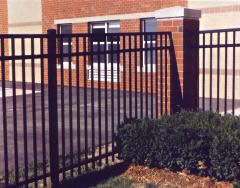 This style utilizes a flush-top rail to produce a stately and streamlined look. The three-rail works well with brick. Your new development can and will appreciate this entranceway appearance. This looks great with wood as well. Let us help you design your own unique look for your new development(s). We are creative! Semi-privacy creates beauty on both sides. 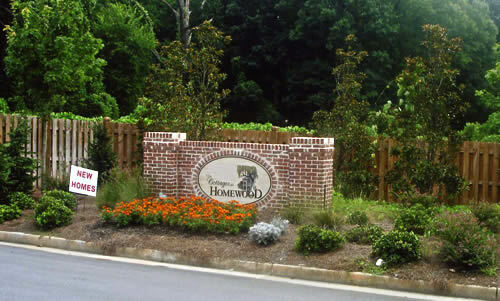 This fence says that you care about the inside and outside of your development. Words cannot express this piece of art. 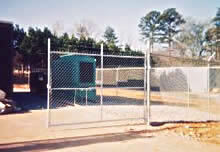 Quality fence designed this for a wedding chapel in Bogart, GA. Please see this across from Benson's Bakery. 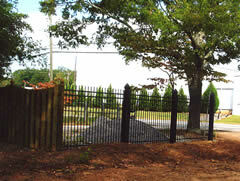 Most new subdivisions require black chain link and it's also maintenance free. 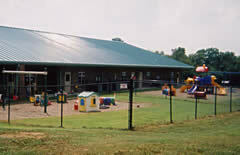 It is the number one choice for playgrounds & dogs. 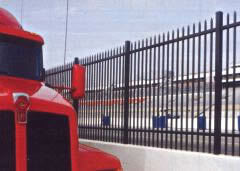 Simple but effective privacy fencing.